This post is a part of a paid promotion with Wewelka USA. I was compensated for this post, but all photos, words and opinions are my mine. Have you heard that expression? I'm not sure if the idiom is supposed to mean it's easy as eating pie or easy to make pie. I've got both statements covered with this recipe for Cranberry Merlot Pie. 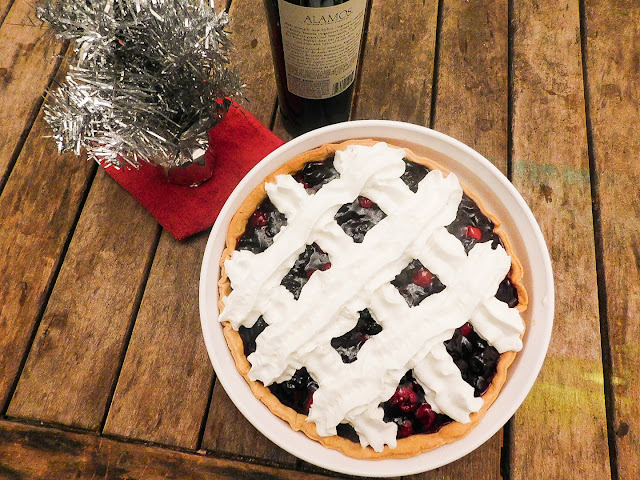 AND if you scroll down a little bit, you can enter yourself in this contest to win some FREE Wewalka pie crust for your holiday baking. 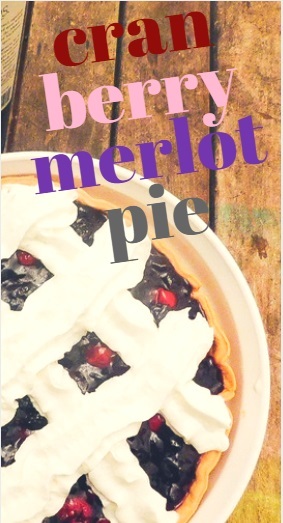 This pie is as easy as can be with dried cranberries plumped up with juicy, full-bodied Merlot wine, accented with cherry pie filling, a sprinkle of cinnamon and a dash of lemon zest. The pie can be left plain, dusted with powdered sugar or decorated with whipped cream. The flavor reminds me of a semi-sweet mulled wine. The whipped cream lattice reminds me of pies I used to see at a pastry shop when I was a girl. This time around, I'm using the new Wewalka pie crust which bakes up buttery, flaky and is found in your local grocer's refrigerated case. Wewalka does all of the work. All you have to do is roll and bake. The crust comes on a sheet of parchment paper, so you don't even have to touch the dough, except to crimp the edges of your pie. Wewalka Pie Crust is 25% thicker than other crusts and fits perfectly in a 9” pie. Just unroll, fill and bake. There is no waste when making single crust pies like this one. Whether you're using one crust or two, Wewalka has you covered. I'm not new to this brand, as I've used other products in other recipes in the past. As an on-the-go cosmopolitan person, I don't always have hours of time to make my own dough, measure it out and freeze it for future use. Just picking up this dough will save me time. The only thing I will have to worry about is what kind of pie to make. Enough talk. Go ahead and enter the contest and scroll down a little bit more to get the recipe for this sweet, boozy pie! 1. Preheat oven to 375˚F. Line baking sheet with parchment paper. Move oven rack to middle position. 2. Bring wine and cranberries to a boil in a medium saucepan set over medium-high heat. Stir in cinnamon and brown sugar; return to simmer for 5 additional minutes. 3. Remove from heat; stir in vanilla extract, orange zest. Set aside to cool completely. Fold in cherry pie filling. 4. Fit one pie crust into 9-inch pie plate. Flute edges. Dock bottom of the crust with a fork or a docking tool. Blind bake for for 15-18 minutes. 5. 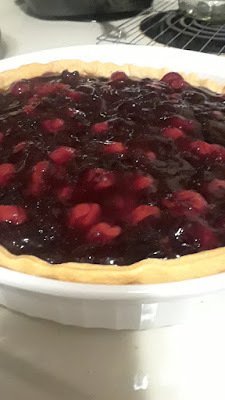 Reduce oven temperature to 350ºF, scrape cranberry filling into prepared crust and bake for another 25 to 30 minutes, or until filling is bubbling. Transfer to wire rack to cool completely. Garnish with whipped cream. Serve. Pecan!!! Maybe apple... or maybe even a chicken pot pie!